Herb Pharm uses freshly harvested Echinacea purpurea which is Certified Organically Grown on their own farm and is harvested at its optimal potency. 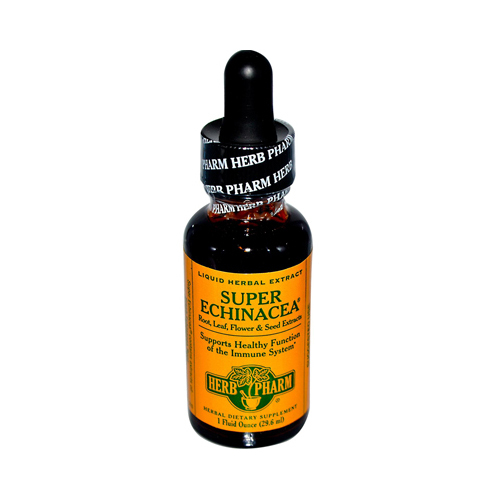 Super Echinacea by Herb Pharm is prepared from: Fresh Echinacea Root Juice Mature Echinacea Seed Fresh Echinacea Leaf Juice Fresh Echinacea Flower Juice (Contains no stem.). Super Echinacea is a full-spectrum extract containing Echinacea's water-soluble and alcohol-soluble constituents. Our Echinacea is never fumigated or irradiated. Disclaimer These statements have not been evaluated by the FDA. These products are not intended to diagnose, treat, cure, or prevent any disease. Ingredients: In a base of certified organic grain alcohol and distilled water.